New Website(s)! New Logo(s)! Bigger Office! When you visit CORE10, you'll find we've expanded to accommodate growth and plan for the future. 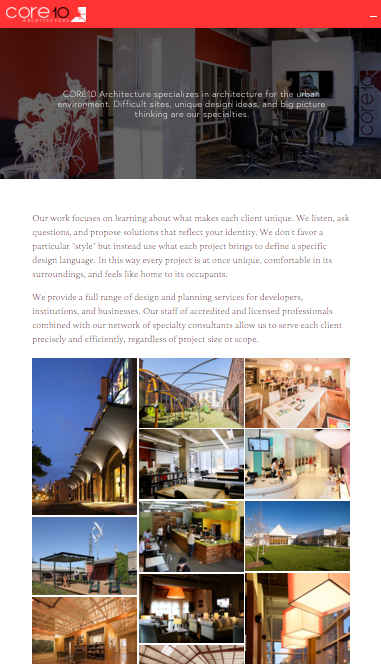 And when you visit core10architecture.com you'll see we've done the same! After years of enjoying the cyber-hospitality of our partners & friends from lelander.com (thank you), we are updating our web presence and splitting it in two. You'll find our commercial & institutional studio at core10architecture.com, and our residential studio at core10residential.com. To follow both studios on social media this year, check each site for updated links and content. Older PostMichael Byrd named to the Board of Directors at the new SLMBC!